Well, to continue with the post-modern discussion around here…Please consider this a thought experiment (and, like any experiment, it could be horribly wrong from the get-go). I want to bring up a subject that hopefully will garner a good deal of debate. I want to talk about single-issue voters. But I want to do it by first recasting the terms of the debate – ie, by changing the focus from judging what such a voter is to what such a voter does (the latter of which of course can’t be done without first addressing the former) . The whole idea of identities first requires a bit of unpacking, because identities are tricky things. They’re constantly in flux. You have a million different identities that exist as they are evoked by contrast – you are a liberal in relation to conservatives. You are a subordinate in relation to your boss, and a boss to the others operating beneath you. You define yourself by a sense of othering, by negation, telling who you are by telling who you are not, and the way you do this changes with each context. And why do you do this? Why does it matter who you are? Each categorical identification has a different strategic advantage in its power effects. This means that people treat you differently depending on how you present your identity at a specific place and time, and they allow you to treat them differently as they best respond to you in order to maximize their strategic advantage. The important thing isn’t what your identity is, rather what it does. I urge you to “be prepared” for what you are about to read…Thankfully I was given an article originally printed in the Loudoun Times. For your reference, and should you choose to read it, it is, perhaps perpetually available at www.loudountimes.com, dated August 24, 2011 and titled Potomac Falls woman removed from son’s Boy Scout troop (Laura Peters-author). One of the most important things that I learned from this article is that Jackson and Jaden Steele are two extremely lucky young boys. They’re fortunate to have two loving parents which is far too often not the case. It just so happens that both happen to be mothers. Before I get deep into the story, I want to share an experience of my own. When my oldest was six, we joined the YMCA Indian Guide program, (now the Adventure Guides, for PC reasons), and it was, in my view, the ultimate bonding situation. Their slogan, Pals Forever, was made true by the fact that, meetings, camping trips, etc. were all done together, father and son, in groups with other pairs. When Steve became too old to continue, we decided to join a Cub Scout troop. During our first visit, we found that a Den Leader was needed, which I jumped on immediately. The Scoutmaster was happy, especially since I was the only volunteer. I’ll only say that at times some of the other parents actually let their car slow to a near stop before they pushed their kids out for the weekly meetings. To the other parents, we were a great Thursday night free babysitting service. It was only I that was bonding with their kids. My younger son Kenny only participated in Indian Guides for that reason. I was amused to discover over coffee this morning after the storm, that during the night Too Conservative had nothing better to better to do than poke at my art and interest in animals. They did find a typo and thanks for that. Probably didn’t like the spaniel on my palm card either, but this just shows how tone deaf the Republicans are in Loudoun County, a place where people actually love their pets, horses and livestock. Maybe Too conservative doesn’t. 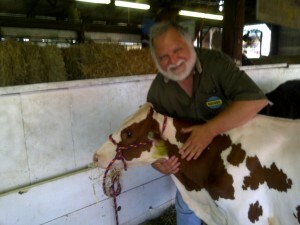 In fact, I think the Republicans skipped the County Fair. To me, conservative should mean conserving what resources we have, not wasting them. Surely, any conservative would agree that preserving livestock, the principal means of income for many Loudoun citizens in more than on district, is a good idea, same for protecting pets in every district. I never saw that as Blue or Red. The fact is, as a global issue, of the poorest people on earth, about a billion (including Americans) depend on livestock for food or income, but so do middle class Loudoun residents who work on farms, not just the owners. If you take away the livestock from the very poor, people will starve or be unable to support their families. That’s the animal welfare I mostly focused on in Hurricane Katrina and Cyclone Nargis, or when moving cattle off of an active volcano in Costa Rica, or negotiating standards with the Red Cross and the UN to help refugees and the internally displaced have a sustainable life after they returned home from a war or a flood, or when I worked on combating climate change — in other words, building human jobs and saving human lives, real economic development in other words. Again, never saw this as a Red or Blue issue. So I guess what this all means is that once again Republicans don’t know their science or economic development principles, just politics. It was fun however reading the comments on my art, the good and the bad. I’m having a show in January and will make sure everyone is invited. An interesting article in the August 27, Huffington Post describes the relationship between Rick Perry and “conservative Christian” businessman and financier Dr. James Leininger. The entire article is worth a read. I’ll quote the section on Leininger’s largess to Patrick Henry College. Readers may also want to note that Dimitri Kesari, Eugene Delgaudio, and his former aide Donny Furgeson all have Texas ties, as does Prison Fellowship Ministries. The head of the Texas State Board of Education is a PFM “Centurion” (an activist who has completed a program of ideological training to implement the PFM/Chuck Colson “worldview”). Leininger has also bankrolled a number of anti-abortion groups, including Texas Right to Life, Heidi Group and the Christian Pro Life Foundation. His charity, The Covenant Foundation, Inc., contributed at least $450,000 from 1997 to 2005 to the Medical Institute for Sexual Health, an abstinence-only advocate. In 2005, he gave $100,000 in support of an amendment banning gay marriage. The Covenant Foundation, Inc., charity has also been another way for Leininger to project his money into Christian conservative causes. The biggest benefactor of the charity’s largesse in the past few years has been the conservative Patrick Henry College, which received $9.3 million in contributions from 2008 to 2009. Leininger sits on the Board of Trustees of the school. Wherein a few loose ends are explored. That statement might surprise those who read my interview with him on Equality Loudoun back in 2007, in which he talked about Muslim friends and gay friends in a way clearly intended to dispel the rumor that he harbors bigotry. What might also surprise you is that his views haven’t changed since then, and that he doesn’t see any contradiction. He genuinely believes, I think, that these statements do not constitute bigotry, and he is not alone in this view. Would be crossposted from Equality Loudoun, except we’re down for maintenance and migration. Returning soon. What a ridiculous story this is. Scouting (like the military, like every other part of life) includes people who are openly gay. That means parents who are leaders and volunteers, and scouts themselves. For the most part, participants act as if those embarrassing prohibitions on people simply being who they are no longer exist. In fact, they will no longer exist for service members as of September 20. The two women get it exactly right, I think. At some point a quasi-public organization practicing overt discrimination like this finds itself so out of touch with its members and community that its bottom line is affected, and incidents like this only create a humiliating awareness that these policies still exist. The best part of the story, though – the one that shows the Boy Scouts will be just fine – is this perceptive remark by a friend of the family, after reciting the scout law (a scout should be trustworthy, loyal, helpful, friendly, courteous, kind, etc.). This is an Eagle Scout who has internalized the values of scouting and understood them much better than the reactionary leadership at the top of the hierarchy. The right thing to do is to acknowledge the truth you can see for yourself, and to stand up for your friend. There are many more like him. Carl Jung coined the phrase synchronicity to explain the odd coincidences that feel like answered prayers, messages from God, or prophesies. I had such an experience today. 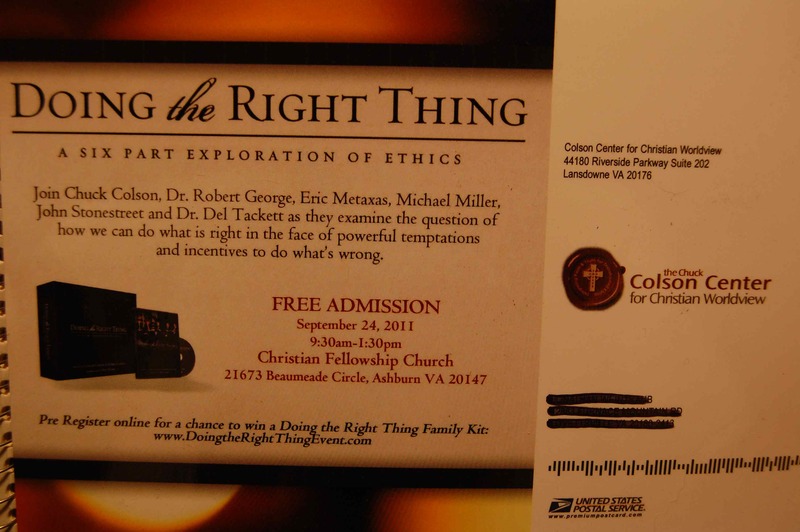 Chuck Colson invited me to a “Doing the Right Thing” showing at the Christian Fellowship Church of Ashburn. Thirty minutes after reading the invitation, I received a note from my friend Stephen Johnson alerting me to Laura Peters’ article in the Loudoun Times Mirror; Potomac Falls woman removed from son’s Boy Scout troop. Phil Holliday, the executive pastor at Christian Fellowship Church and Esther Schaeffer, the charter organization representative, say they are simply following the rules. When a chartered partner agrees to sponsor a scouting unit, an annual charter agreement is signed, they explained. The controversy started when assistant scout master Skip Inabinett decided to “help” Steele by trying to break up her family. Apparently, “God’s” work doesn’t involve rules of protocol or common courtesy. To bring up an issue, there are certain steps of going about it starting with the scout master, then up to the committee and committee chair then to the charter organization. But, according to Steele and Funk, Inabinett went straight to the Boy Scouts of America with his complaint to get her removed as an assistant scout master – and it worked. “He didn’t go through those steps. He skipped over the scout master, he skipped over the committee, he skipped over the district. He went straight to the highest level because that’s where he would get his answer. He went to the highest point to get me removed,” Steele said. 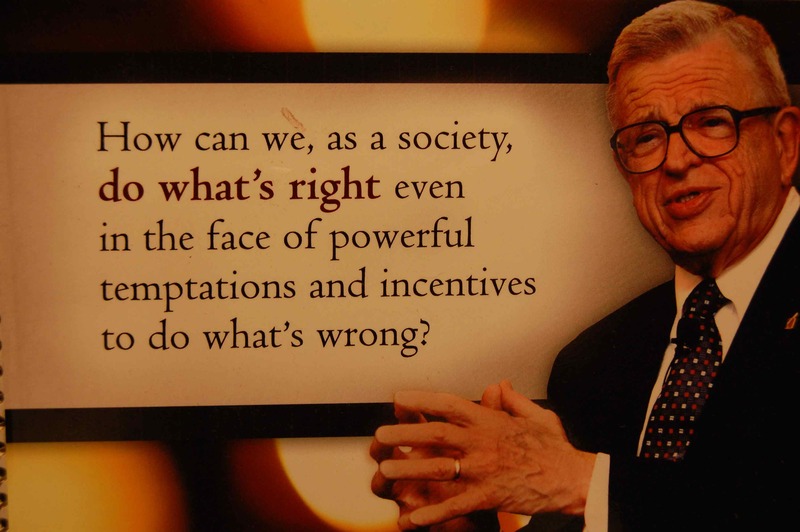 So this is the legalistic bullying behavior Chuck Colson teaches as “Doing the Right Thing“. Good to know. When do we pull his tax exemption? He doesn’t need our tax dollars to pay for this behavior. There has been some question as to who is responsible for the decision to remove Denise Steele. At 7:31PM on Aug 31, 2011, Denise posted a comment on the Loudoun Times Mirror article where she confirmed that Phil Holliday coached Skip Inabinett and served as his proxy. Skip has not said one word because he believes in what he did (no one can change that and I know he will not apologize). He has been “coached” and supported by the Executive Pastor, who also believes Skip has done nothing wrong…to the point Phil spoke on Skip’s behalf about Skip’s “intentions” when he met with us. Update: 201108232315 – This post was published too quickly as I ran down the rabbit hole of ridiculousness that is the Ramadan campaign and found myself late for work. Prayfully, this version will contain editorial changes sufficient to satisfy my husband and the audience. Citizenship rights begin when sperm meets egg. The candidate will sometimes misleadingly use the phrase “human life begins at the moment of conception“. Marriage as defined by God is between a man and a woman. Any aspect of our culture that affirms the existence of married gay couples (and by extension, the existence of LGBT people) must be combated by legislation, regulation and bullying. Government must never confiscate private property, unless it is needed to build a road, erect a religious symbol, or store nuclear waste. The clip below is a near-perfect illustration of the fundamentalist mind at work. Notice that Perry doesn’t even seem to grasp the concept of empirical evidence as something that ought to be considered in formulating policy, and is flummoxed that the question is framed that way. As an abstract idea, “abstinence works.” Pointing out that abstinence-only education doesn’t actually work in practice is missing “the bigger and better issue.” To the fundamentalist mind, it’s making sure that the correct ideology is expressed – not an actual reduction in teen pregnancy – that has become the policy goal. This is not “conservatism.” It’s a form of insanity that rejects evidence from the observable, material world, and it’s undeniable that it has fully infected the Republican party. When it’s welcomed as a “brave act of political suicide” for a Republican candidate to stand up to the anti-science know-nothings claiming to speak for his party, there is an obvious problem. As can be seen from the comment thread on the previous post, it’s possible for people of good will to disagree and struggle with each other about what works best to solve problems in the real world. The only premise required is that there is an actual real world in which to test those solutions. Is anyone willing to insist on that? I’m voting in the Republican primary on August 23, and I’m going to vote for the most right-wing crazy-crack-pot candidates on the ballot. If you want to keep these folks out of office, get out and vote in the primary. It’s the right thing to do. Randy Minchew: A purportedly moderate Republican who steered the Loudoun GOP to the right and believes that unimplanted fertilized embryos have more Constitutional rights than women. Ken Reid has a LTE endorsing Minchew. Reid says “Randy is a man of integrity and commitment to God, family and community.” Reid also says “John Whitbeck, has flooded the 10th district with outlandish mail pieces which often stretch the truth about Randy’s record.” It sounds like Whitbeck is the front running challenger, and if Reid thinks he’s “outlandish”, he must really be out there.